Good evening, dear readers! I have had a busy day, so this post is going up much later than I had planned. I'm also dealing with a nasty headache and plan to get to bed as soon as I am finished this post. 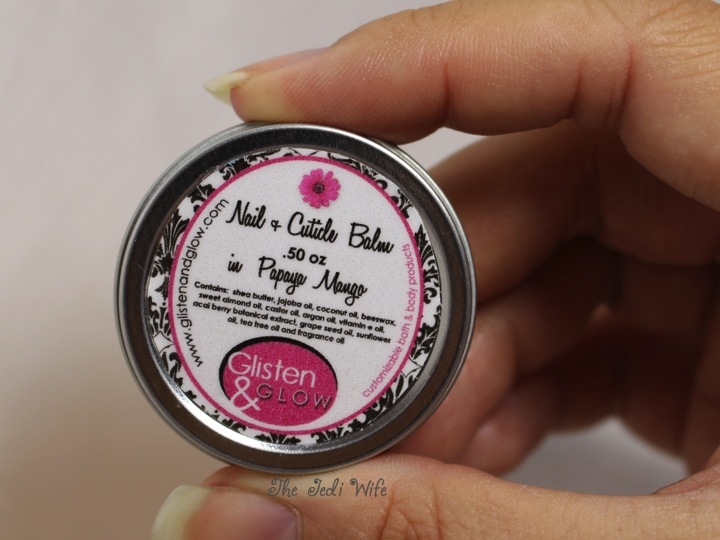 As you may already know by now, I am a big fan of Glisten & Glow's products, and I picked up one of Jill's Nail + Cuticle Balms in her newly released fragrance Papaya Mango. Oh my goodness, does it smell good! I'm a big fan of tropical scents, and this lightly sweet fragrance is amazing! 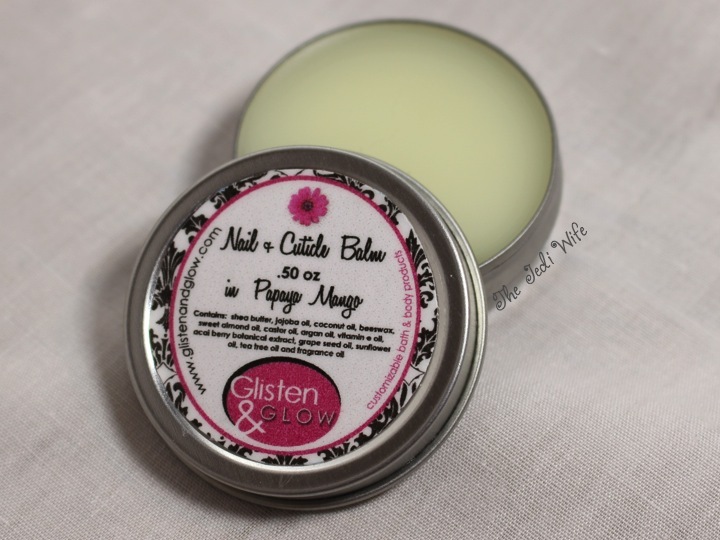 The Nail + Cuticle Balms come in these cute little tins that are the perfect size to slip in your purse to carry along with you. I like to carry one on me so I can quickly moisturize my cuticles no matter where I am. In spite of the first ingredients being shea butter, jojoba oil, and coconut oil (the perfect combination for cuticle care), I didn't find it to be too greasy or heavy on my cuticles. It absorbs very quickly so you can continue on with your busy day. 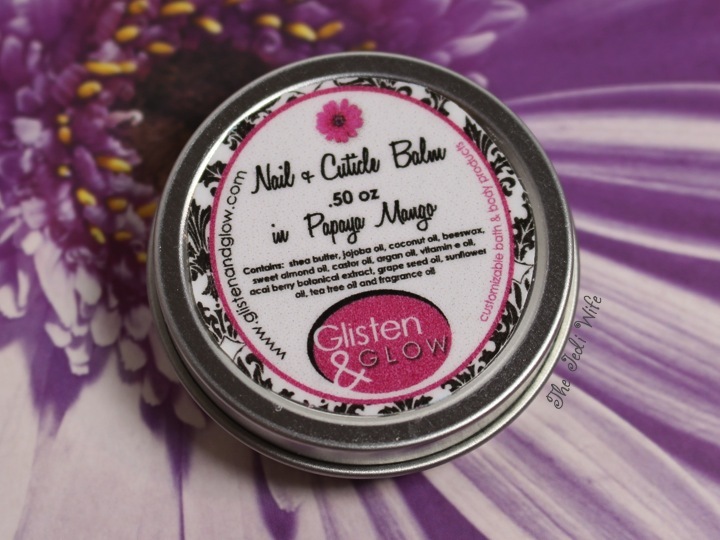 This Nail + Cuticle Balm can be purchased directly from Glisten & Glow here. You can also follow Glisten & Glow on Facebook and Instagram for shop announcements and sales. 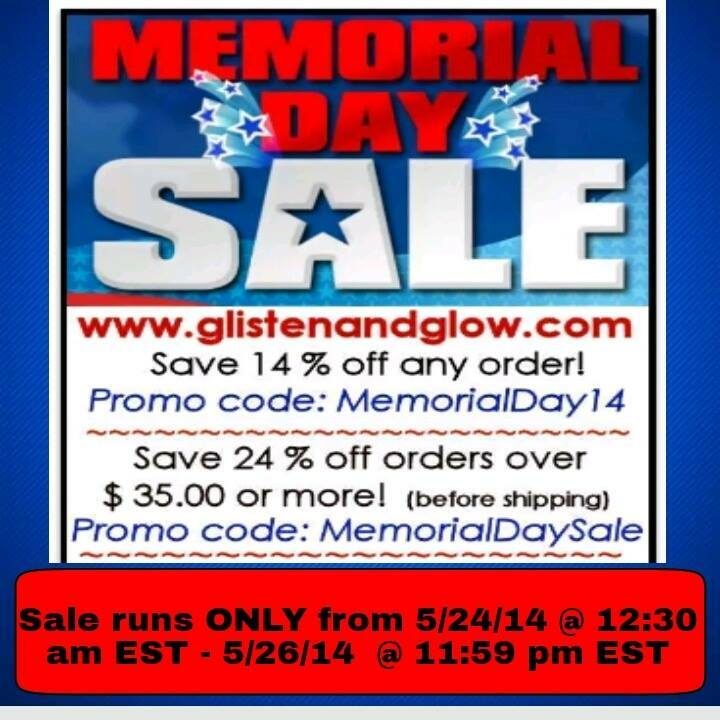 Glisten &Glow is currently having a Memorial Day weekend sale as well! Save 14% off any order using promo code MemorialDay14 and save 24% off orders with a minimum of $35 before shipping using promo code MemorialDaySale. Purchases must be completed by 5/26/2014 at 11:59pm EST! Until next time, dear readers, have a wonderful night and enjoy the rest of the weekend! OOHHHHHHhhh this sounds lovely - I love my G&G products! I love solid products like this! So much more convenient. And the scent sounds amazing!